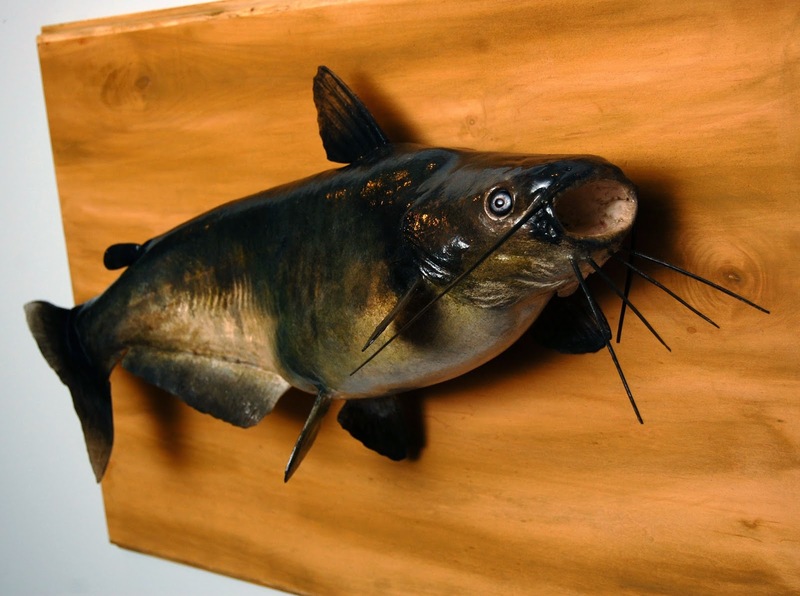 Or from Wisameckhan, which is Lenape for "Catfish Stream". 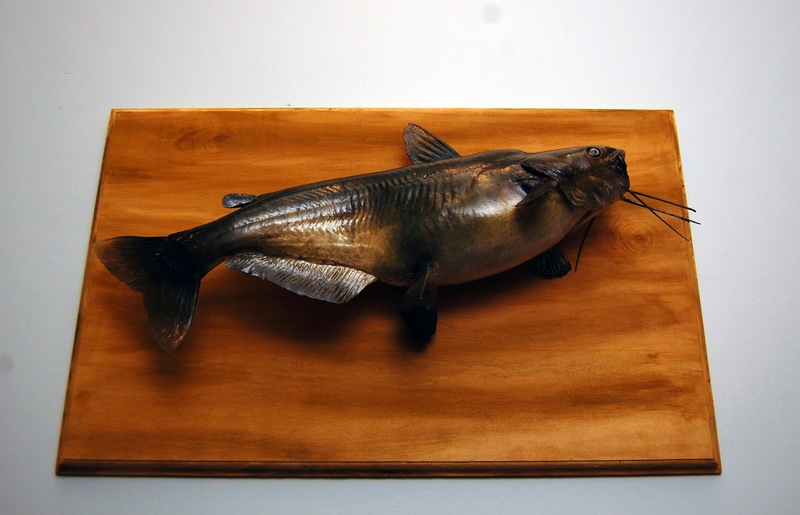 This beast was caught on worm from the Wissahickon Creek here in Philly by my client, and it has been a saga of a commission for this taxidermist. I'm not crazy about doing fish, but this guy has a happy ending. He's kind of sad looking here but I got the information I needed, and comforted myself with the fact that I'd have a good meal of him at the very least. My client is a man who has pulled over at the sight of a roadkill bear just to cut the cheeks off for meat so we are kindred gastronomical spirits in a sense. Imagine my disappointment when I learned there was a city-wide warning against consuming catfish due to so much water in the Fairmount Park creeks being contaminated with sewage. Bummer. I'm not blessed with having a swell relationship with the airbrush, so I was dreading this project. Also, after I gave a price and the deposit was paid I realised how profoundly I had underestimated the proper charge for a piece like this. It turned out to be the least cost effective commission to date; at the end of the day I received about $20 more than I spent on parts/materials. I'm comforting myself with the fact that this was a learning experience for me, as it was my first nonskin fish mount. I abandoned the airbrush early and worked loosely off the catfish paint schedule I have, incorporating my own reference photos for his distinct markings. I actually got really into it and it turns out I love painting! I spend a few days a week working as a painter for a set design company when the taxidermy work is slow, and I guess I've picked up a thing or two. 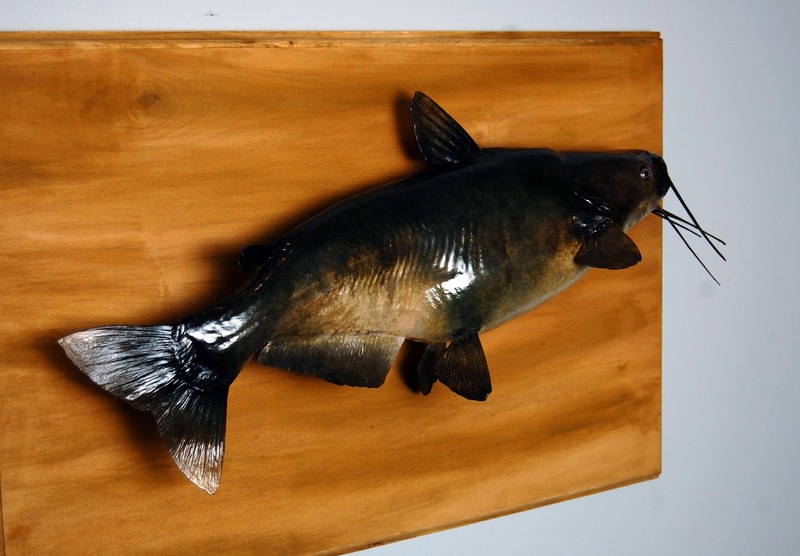 So this is my first repro fish mount that I toiled over for weeks, and I am very pleased with the result although I refuse to call it taxidermy. I will call it art, however. My client was thrilled as well, which is always rewarding. 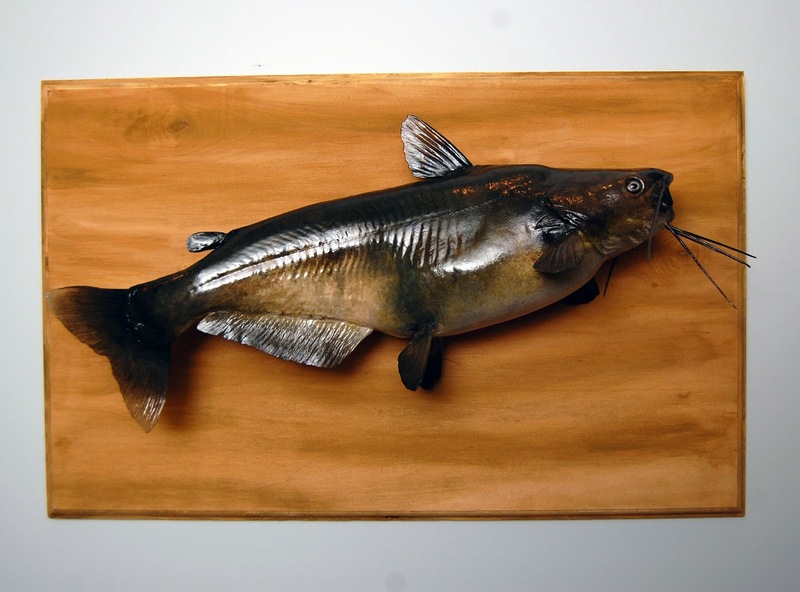 There is a space on the lower right part of the plaque where an engraved brass plate will go, describing the species, with date and location of the catch. And now that the cattie's out of the bag, I hope to have the opportunity to do more in the future.